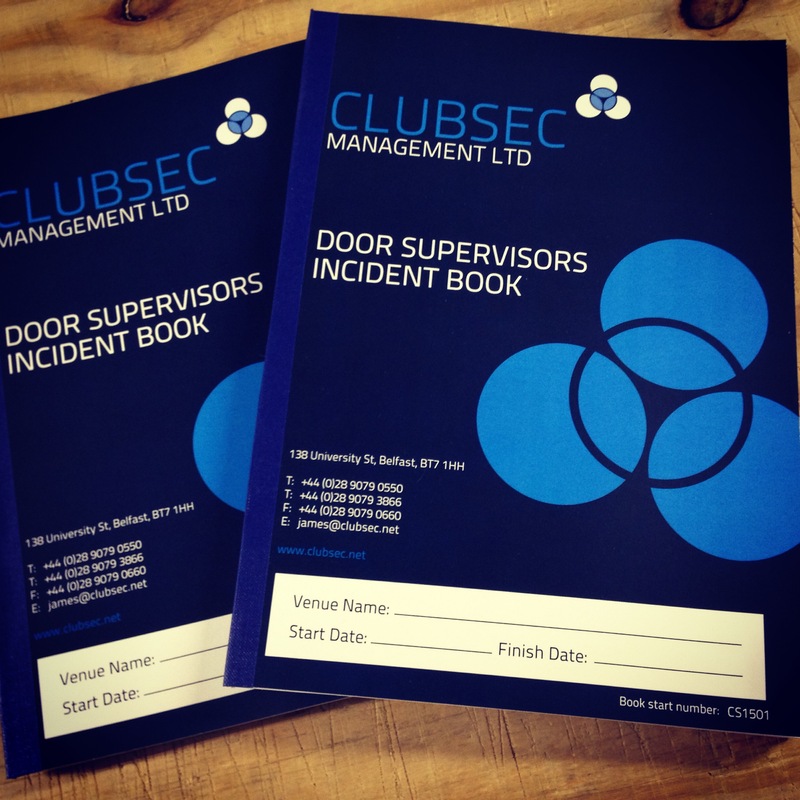 Our good friends at Clubsec Management came to us looking bespoke Door Supervisor Incident Books to give to each of the many venues they work with across Belfast and the rest of Northern Ireland. Working closely with the team we were able to create this great book to record every vital bit of information a door supervisor may need to record. First up was brand recognition. Clubsec Management had previously used an unbranded booklet. While it served a purpose, they found it was easily misplaced and so we came up with a fully branded cover that can be tailored to each venue Clubsec work with and the dates the booklet covers. This makes storage and retrieval of information super easy. Our books have 100 sequentially numbered pages. They are securely bound with staples and tape to ensure no pages fall out. We also provide 2 double sided page per shift to record the following details: The door supervisors on duty SIA Badge number Time in-out Refusals at door log Fire exit check log Capacity check log Floor / toilet checkÂ log Enforcement visit log Record of incidents log As per the request of Clubsec Management, we also provided a double sided page left blank (bar numbering) to record any additional information required. As a company that prides themselves in best practice across all areas of their business, Clubsec Management utilise this booklet to record incidents and show due diligence, as well as providing a manageable systems whereby staff can ascertain any actions required since their last shift such as any customer who may be barred or has created a complaint against the door supervisor. Our Door Supervisor Incident Books come in batches of ten books and can be customised to your requirements for just a small fee. Let us know what you need on them, what number to start from and send us a high res copy of your logo and weâ€™re ready to get printing.